When you pair your smartphone, your work, family, friends and more can be with you wherever you go when you let your vehicle's multi-media system put your entire world within easy reach. Music, news, sports, podcasts or talk radio—everything you want to hear is accessible right here, for your listening pleasure and convenience. 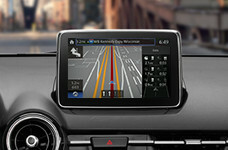 Whether you're taking a family vacation, traveling for work, or going out for quick cup of coffee, your vehicle's optional navigation system will help you arrive easily at any destination. Comfort and convenience are yours when you fine-tune the options and settings throughout your system to suit your individual preferences and needs. A little preparation and customization and you're well on your way to taking full advantage of all the convenience your Multi-Media system has to offer. SMS (Short Message Service), MMS (Multimedia Messaging Service) received by connected devices can be downloaded, displayed, read aloud and responded to, all from your vehicle. 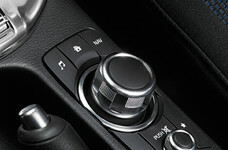 Pair the phone to the vehicle using Bluetooth®. Click here for instructions. On the phone, open Settings. 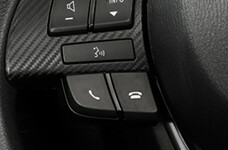 Select the "i" information icon for the connected vehicle for your device. Switch "Show Notifications" to ON. 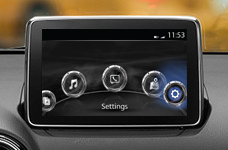 Select COMMUNICATION from the vehicle Home screen. Turn Bluetooth® OFF/ON by unchecking/rechecking the box to disconnect/reconnect the paired phone. Select COMMUNICATION from the vehicle Home screen. SMS should be displayed in white for text messaging to work. Not all received messages may be displayed. Received messages cannot be replied to with preset messages. Select Text Messages from the Communication menu. Select Update Messages (SMS); download from connected mobile phone will begin. Select Notifications from the Communication menu. Select INBOX LIST for list of current messages. Make your selection. Select PLAY for audio playback of message; press again to pause temporarily. Select PREVIOUS to display more recently received message. Select NEXT to display previously received message. Select REPLY; select message; select response from message preset list; select Send. Select REPLY TO ALL (email only); select message; select response from message preset list; select SEND. Select CALL to make a call to the sender of the current message (for email, sender must be in contacts). Select DELETE to delete current message in both system and connected device. Select Settings from the Communication menu. Select preset message you wish to edit; use keyboard to edit; check to store revised preset message. Disclaimer: Standard carrier charges apply. Please contact your cell phone carrier for details. – When driving, the system will only read the message to you. You will not be able to view the message. – Up to 15 preset messages can be selected for a reply. – Up to 20 new SMS messages can be downloaded and displayed from a connected device. – Attached data is not downloaded. – Messages up to 1 kilobyte (email)/160-bytes (SMS/MMS) can be downloaded. – A message list is created for each device. – Select arrow on keyboard to switch between capital and lower-case letters. – Select BACK to return to previous screen without storing edit. – Instructions may vary, depending on your system's version of software. – Acknowledging a download permission operation for some iPhone and Android phones may be required depending on the phone. – Overall device compatibility as well as individual feature operation and functionality is contingent upon the device software version, device operating system, device settings, wireless service provider, and third party applications installed on the device. Individual user results may vary. ScionUSA and Visteon Corporation are not responsible for software irregularities or hardware issues devices may experience that are outside of our testing scope. As new device software versions become available, test compatibility results may change so please check these results regularly.